Show me your nest boxes! Discussion in 'Coop & Run - Design, Construction, & Maintenance' started by aggieterpkatie, Aug 8, 2009. 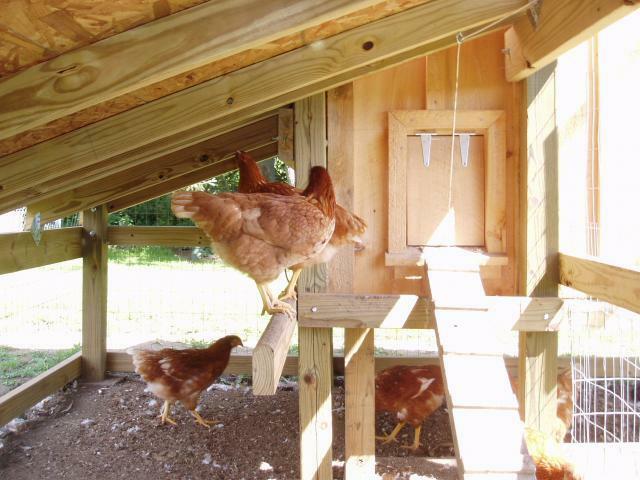 We built a coop a while back, but never added the nest boxes because our chickens weren't yet laying. Well, we need to get them built now and we'd like to build ones that are framed outside the coop, so we don't take up any floor space. Does anyone have any like that? Show me! I'd love to see how you did yours!! Mine are actually on the inside, but they dont take up any floor space. There are two nests on each side of the door. My nests are not outside, but they are off the floor so they don't take up floor space. The "poo park" (roost) doesn't take up floor space either, so my 9 girls have the whole 8x8 area to stay when the weather is bad and may not be able to go outside. Having the roost area self-contained above the floor space makes cleaning it out easy, too. 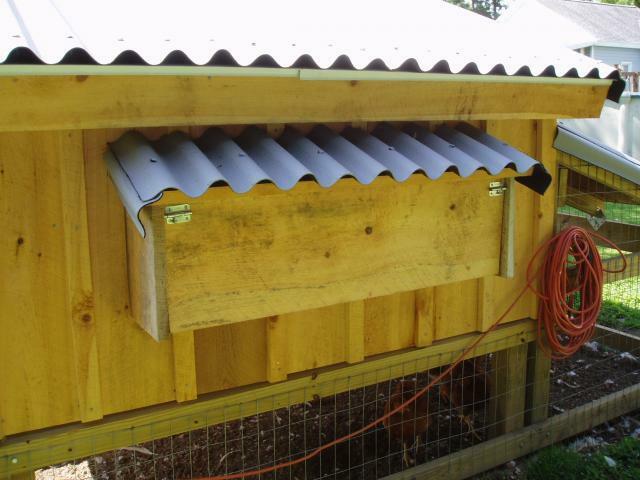 Here is how my husband put our egg boxes on the coop. I just love it, its so easy to get the eggs. You just open the doors on the back. 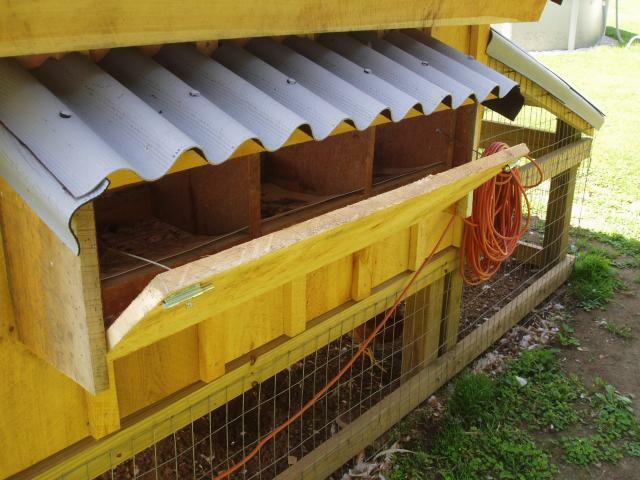 Here are my nesting boxes. My birds are about 14 weeks old now, getting close. Just got this much done yesterday night. It's not mounted yet, just setting in place. I've got to place a lid onto it and get it sealed and painted. Make it as such so that it's removable, in the event that I want to change it to an inside box or other layout. Will make my life easier in the future should that need arise. 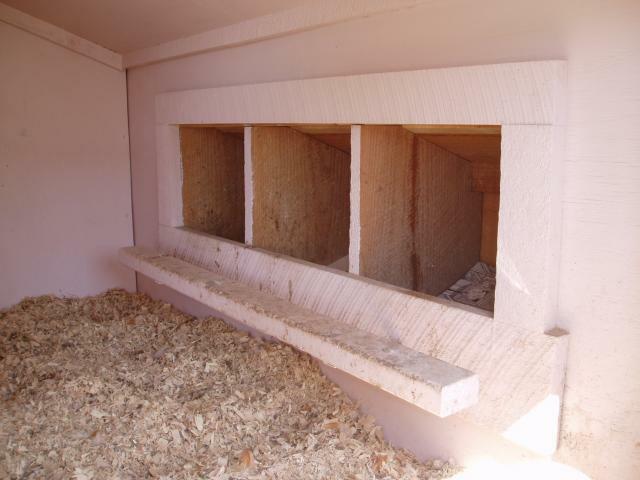 The layout is a community nest box, so no dividers. It's 42" wide, so if divided there will be a little over 12" per three boxes. I wanted to try the community nest style first though. The opening into the coop will be covered with a dark curtain with a single opening at the center. 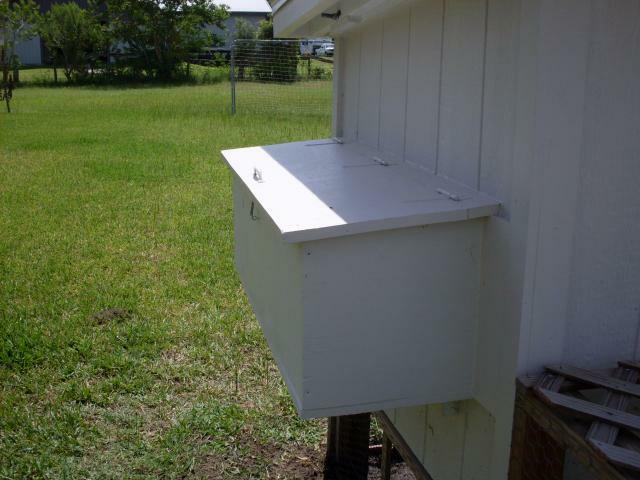 A bar will be mounted in front of the box so that they can hop up onto it and then enter the nest. Thanks for all the great pictures!!!! Well, this won't help you any but I just wanted to show off a bit. We took an old camper and converted it to a coop. We took the doors off the lower cabinets and added a separator to make nest boxes. We also took the door off of the oven and made another nest box out of it. Maybe we're weird, but we just think it's funny to see the girls voluntarily getting into an oven. Quote:Oven nesting box is hilarious!